I didn’t fall in love with the ocean or sailing until my 12am -6am graveyard shift on day five. Before this was, well, hell. We both got sea-sick 40 minuets after leaving the British Virgin Islands, which for me consisted of constant nausea, dizziness, followed by certain vomiting after I ate/drank/walked/did anything. And so my days were spent with my eyes closed, trying not to vomit, and awaiting my next watch, where I would invariably vomit. Sure enough after 2 days I began to get better, but I still didn’t really enjoy sailing. I just did it to pass the time on my shift until I could sleep. This all changed on day five on the graveyard shift. The evening before my shift contained cloudless skies all the way into the sea, where we watched the sun slowly disappear. The clear skies continued into my shift which began at 12am, flooded with stars. The wind was light, but just enough to sail 4 knots, and I was able to use the north star to sail by. Shortly after I started the moon began to set, a perfect crescent that began to swell as it came closer to the ocean. The brilliant luminous white turned to yellow, then amber and then red as it bulged further and slid into the ocean. The moment the moon disappeared the wind and waves dissipated and the sky darkened. It was now time for the stars to swell. The calm sea gently lapped against the side of our small boat, just enough to disturb the phosphorescence into a spectacular underwater firework display. Subterranean blooms of florescent light burst from the inky water, throwing the phytoplankton sparks in every direction, fading as quickly as they bloomed. We were floating on an electric blue cloud in the middle of the dark, lonely ocean. When navigating by the north star, over time, you can see all the other stars move around the sky, rising and setting. The Milky way also rose above the southern horizon and into the sky, becoming clearer and more profound. Majestic. A thick streak of stars and gas clouds, ebbing and bellowing across the sky, stealing the limelight from every other star in the sky. I sneaked peaks as I steered the boat northward. At 1am the shooting stars began, darting by the north star, but it wasn’t until 3am, when I came off the wheel and onto standby, that I got to see the full shower. Some left momentary trails of brilliant light, others a small explosion fading into a dull object falling into oblivion. I must have seen near 50 through the night as I lay staring into the sky. Back in the calm water clusters of luminous orbs were rapidly spat out from under the boat and then trailed behind the boat off into the distance. These fields of jellyfish littered the sea. Around 4:30am a large yellow light appeared on the horizon to the east. We first thought it was a boat’s steam light, but as it strangely began to get higher in the sky we realised it was Venus rising. Venus’ reflection was so bright it cast a long, thin reflection across the sea. And as it rose, the first traces of light from the morning sun began to show. It began as a strange green hue on a single point in the east that spread across the horizon. The green was joined by a dull purple and red which began to brighten. The dark horizon line between the ocean and the sky disappeared into a thick haze, and it was impossible to see where the sky began and the ocean ended. The single point in the east expanded into the full spectrum of colours. The stars began to implode, shrinking and within the hour all that was left was Venus. 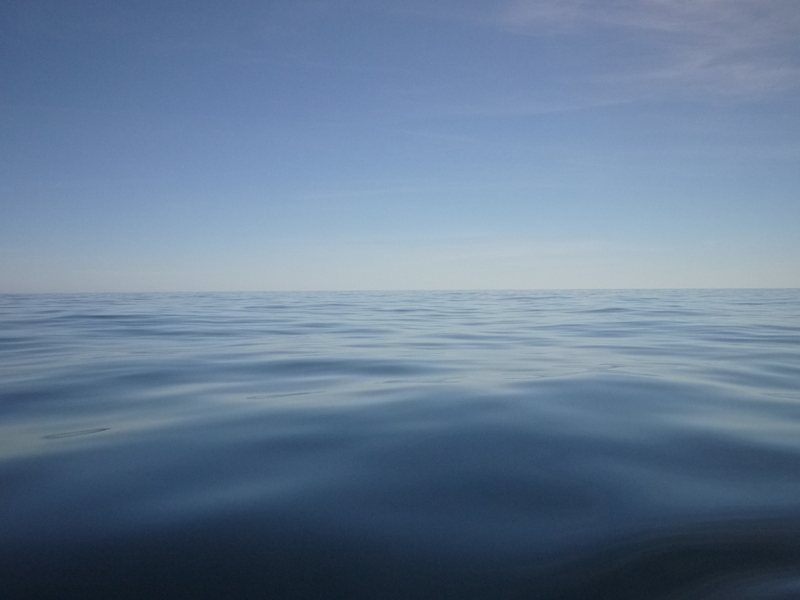 The texture of the ocean became visible, a large unbroken sheet not even breaking around the boat. The phosphorescent faded and only the last few dying flecks remained. And the sky. In the east deep reds, oranges, purples expanding across the horizon and for a moment there was a red band that circled completely around us. The red intensified and retreated to a single point where the sun pushed up through the sea. I had always believed that sunsets were more beautiful that sunrises. Perhaps because I had never before watched an entire night pass through to sunrise with such undivided attention. Or maybe because this can only be experienced at sea on a clear night where there is only you and the universe. 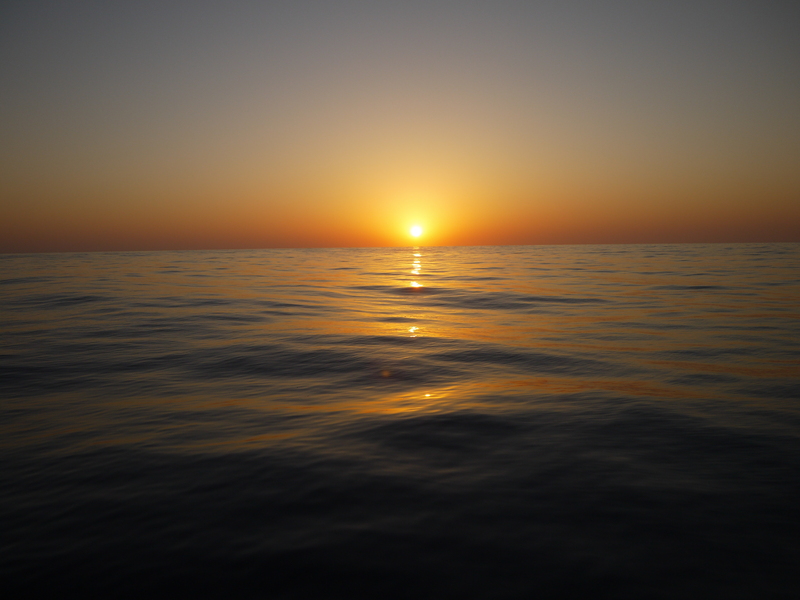 This entry was posted in Adventure, Atlantic Ocean, Crowdfunding, Phosphorescent, Sailing, sunrise, travel. Bookmark the permalink. Cheers Emily, finally got round to it! Wow nice! So well written :). The pic of just the sea and the sky is beautiful! A lovely diary entry. Sorry to hear you suffered such seasickness! Safe travels! I am coming to this particular blog post a little late, but glad I have done so! Its mesmerising, I felt the movement of the ocean through the rise & fall of my breathing as I read. I really want to have that experience of watching the night unfold to day. I’m literally in a daze after that Anthony. Beautiful. Thanks for your lovely words. I feel the same about this post which is why I am happy to tell you that Emma wrote it 🙂 She’s always telling me how she’s not a good writer but all of her posts on here (and this one in particular) lay that idea to rest. She’s captured the feelings I had out there beautifully, and it’s always lovely to know that you felt the same about something as someone else…especially when you’re in love with them! And she took all the photographs too. Again thanks, and it’s lovely to hear from you. Oopsy 😁 that sent too soon…i wanted to say…Emma, you rock!